Ryan Lewis with a brace was joined on their scoresheet by Ryan Dobson, Jim Burnside and Matt Allen to bring up the nap hand against home replies via Dan Stafford twice and Ritchie Bevan once. Still sitting in second are Caldecote who took their unbeaten run to five games by drawing 2-2 at AFC Kempston Town & Bedford College. The game was the first ever staged at Town’s new Kingsfield complex and was played before a league ground hop crowd of 109. Just seven minutes into the contest Delroy Phillps shot the home side in front before 16 minutes later Jack Boyd levelled matters. A header from Justin Newman restored the home side’s advantage in the 34th minute, yet just 60 seconds later it was 2-2 via a successful penalty kick from Jake Wallace. Despite their home defeat Flitwick Town remain in third but are now just a point clear of Wootton Blue Cross who, thanks to a goal from Matt Gurney, won 1-0 at Wilstead thus duly leaping them above Wilstead and now fifth place AFC Kempston Town & Bedford College. The Town themselves are just goal difference ahead of nCrawley Green Reserves who were the 2-1 winners at Kempston Rovers Development, Cullam Yates netting both goals against a lone home reply via Emmanuel Dahie. Up into seventh are Stevington the 4-2 victors at bottom of the table Queens Park Crescents. Jordan Wright, Louis Green, Tom Roberts and Ben Walsh all found the back of the net against Crescents replies via Daniel Rasol and Shahinur Rahman. There was also joy on the road for Ickwell & Old Warden who won 4-0 at Marston Shelton Rovers. First half goals from Marko Tobdzic and Keith Thomas were added to in the second period by Scott Alleyne and Luigi Rocco. Whilst AFC Oakley M&DH took their unbeaten home ways up to three games with a 4-1 victory over Sharnbrook. Elijah Hukin led the way with a hat-trick and was joined on the scoresheet by George Cox against a lone reply from Simon Denton for the visitors. The league’s ground hop day ended at Cranfield United before a crowd of 116 who saw United claim their first home win with a 1-0 victory over Renhold United. The all important goal arrived in the 62nd minute via an own goal off of Renhold goalkeeper Neville Allen. At the end of the 90 minutes the league leaders were now Wixams having ran out the 4-1 winners. However, events of the afternoon saw the hosts end the day in fourth and Sandy now occupying fifth. Gareth White fired the hosts ahead in the fourth minute and this lead was doubled by Grant Tibbett in the 18th minute and duly added to by Max Natola to make it 3-0 just 11 minutes before half-time. It was game over for Sandy when Charlie Battams netted home goal number four in the 63rd minute before Phil Beal headed a consolation goal for Sandy five minutes later. The leadership of the Division One supported by O’Neills is now in the hands of Riseley Sports who retained their unbeaten record by winning 5-3 at Cople & Bedford SA. Jay Willett led the way with a hat-trick and was joined on the scoresheet by Jake Hislop and Alex Taylor against home replies via Ollie Hughes twice and James Munns once. Now in second spot, just a point adrift of the leaders but with two games in hand, are Totternhoe Reserves who were 5-2 home winners over The 61 FC Luton Reserves. Tom Howson with a brace was joined on the scoresheet by Dave O’Brien, Antony O’Grady and Calum Burgess to bring up the nap hand against replies via Jay Sharpe and Kwaku Aning. Just goal difference behind in third are AFC Kempston Town & Bedford College Reserves who remain 100% on the road this season after winning 3-2 at Meltis Albion. Jessie Sidhu, Michael Sexton plus a penalty from Kegan Roberts did the damage against home replies via Adam Cranney and Alexis Kamenan. Up into sixth are Henlow who won 4-1 at Shefford Town & Campton Reserves. Luke Hills with a brace was joined on the scoresheet by Paul Wright and Ryan Lamond against a lone Town reply from Sam Kelly. Elsewhere there was a first away success for Cranfield United Reserves in winning 5-1 at Lea Sports PSG. Paul Garrett with a brace was joined on the United scoresheet by single strikes from Jay Bygrave, Jordan Conway and David Adderson against a lone PSG penalty reply from Joe Hennem. Whilst for Biggleswade FC Reserves it was a first win of the season with a 3-2 home victory over Flitwick Town Reserves. Jonny Bannister, John Veal and Bahador Chizari netted the home goals, with Benn Ward from the penalty spot and Sam Johnson replying for the visitors. There are new Division Two leaders in the shape of Renhold United Reserves after they took their unbeaten away run to five games with a 2-1 victory at Sundon Park Rovers who are still looking for their first win. Jamie Lovell and Hayden Shipp were the United goalscorers against a lone Rovers reply via James Matthew. Losing out on that top spot and now down into third are Houghton Athletic who lost their unbeaten ways when defeated 2-0 at home by Bedford Albion, Paul Babbington netting both Albion goals. Whilst second place is now taken up by Henlow Reserves who netted a 5-0 home win over Wixam Wanderers. Russell Ayles, James Campbell, Stefan Cogman, Martin Bator and Jonny Rowe all found the back of the net. For Elstow Abbey it was win number three on the bounce with a 4-0 home success over Wilstead Reserves. Alex Hughes set them on the way with a opening half strike before the scoreline was added to the second period by Matt Poulton, Mark Allen and David Cullip. Also winning at home were Marston Shelton Rovers Reserves with a 4-2 victory over Luton Leagrave AFC to move themselves off the bottom. Gary Russon, Cain Hamilton-Boyle, Dale Maiciw and James Honeyman all found the back of the net against visiting replies via Richard Mead and Nico Covileac. Elsewhere there were wins on the road for CS Rovers and AFC Oakley M&DH Reserves. The Rovers, with goals from Mark Moriarty, Joe Campion and Joe Lydon, picked up their first away points in winning 3-2 at Caldecote Reserves whose goals came via Luke Freeman and Josh Wilson. M&DH won 2-1 at Westoning thanks to a brace from Justin Muircroft against a lone home reply via Ryan O’Neil. 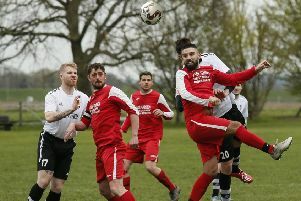 Kempston Athletic are four points in Division Three after winning 3-1 at Lidlington United Sports to take their unbeaten sequence to seven games. Lee Leonard, Luke Mongiovi and James Maxwell netted the goals against a lone United reply via Carl Pearson. Whilst second place Clifton were to lose their unbeaten record when defeated 4-2 at Sandy Reserves who were winning for the first time in six outings. Liam Brophy with a hat-trick was joined on the home scoresheet by Aaron Seldon against visiting replies via Dylan Donaldson and Kyle Davies. It was also a poor day for third place Black Swan who went down to their third defeat on the bounce when beaten 2-0 at home by White Eagles who were recording their third away win on the bounce via strikes from Jan Bucur and George Antoci. Now just goal difference behind in fourth are Harlington who, after three straight defeats, returned to winning ways with a 5-3 win at Stevington Reserves who are still awaiting their first win. Pearce Tracey with a hat-trick and Liam John with a brace did the damage against home replies via Jack Jennings, Colm McGirl and Josh Martiello. Now in fifth are Shefford Town & Campton A who took their winning ways to three games with a 5-3 home victory over Flitwick Town A. John Vooght with a brace was joined on their scoresheet by Bradley Vooght, Sam Lummis and Jacob Jevan. Bedford Albion Reserves now occupy sixth and remain unbeaten on home soil following their 1-1 home draw with Caldecote A who duly remain unbeaten on the road this season. Harry Spillane netting the Albion goal and Tom Dupuy scoring for the visitors. Elsewhere both Dinamo Flitwick and AFC Kempston Town & Bedford College A took their unbeaten run up to four games by sharing the spoils in a 5-5 draw. Daniel Day with a brace plus an own goal and strikes from Steven Smith and Ashley Bratt marked the Dinamo scoresheet against replies via Arkadiusz Boruch with a hat-trick plus an own goal and a strike from Nikola Stanchev marking the Town scoresheet.